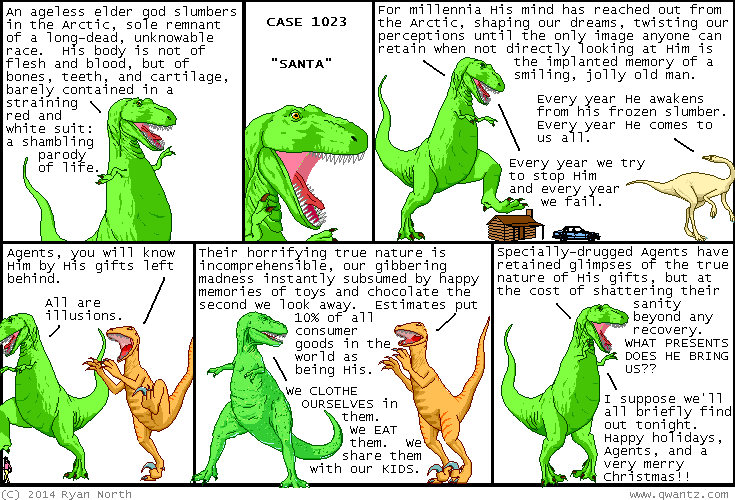 Dinosaur Comics - December 24th, 2014 - awesome fun times! –I believe I shall take a brief repose to calm my agitated nerves! December 24th, 2014: That's it for 2014, everyone! We'll have some KLASSIK KOMIXs to end out the year and then I will be coming back at you to hit you up with some MAD FUNNY CHUCKLEPROMPTS in 2015, in the format of an arcane merging of text and the graphical arts!! THANK YOU as always for reading my crazy comic about the dinosaurs who talk!